Today I get to share with you a recipe that has kind of become a staple around here for when one of us wants something very quick and easy to make but will satisfy a sweet craving, a keto chocolate muffin that takes all of about 2 minutes to make. As long as I’ve been low carb, I’ve really learned how to get by without bread but sometimes you want something that is a little “bread-y” to totally make up a word and this works fantastic. In fact, sometimes I will leave the cocoa powder and sweetener out of it and turn it into a hamburger bun. Nothing wrong with eating a hamburger with a fork but sometimes you just want to pick a bad boy up with your hands and chomp down. 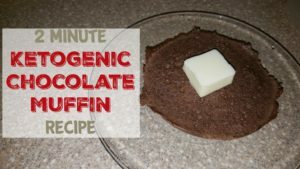 This recipe takes the shape of the bowl it’s cooked in so you can cook it in a ramekin container if you want it to look more like a muffin but I usually just throw it all in a cereal bowl and call it a day. This is also great for a quick breakfast as you are headed out the door as well. You can see all my recipes here and if you decide to make this, tag @MySugarFreeJrny on Instagram so I can see it! Also remember that the 28 Day Sugar Free Weight Loss Challenge started last week so if you are looking for a great support group to help you get the extra weight off, this FaceBook page is the place for you to be. PREVIOUS POST Previous post: ChocZero: Sugar Free Chocolate Review! NEXT POST Next post: 9/21 Weightloss Wednesday: The Weight Continues to Come Off! Pingback: 30 Desserts & Sweets For Your Next Gathering! Oh my. The whole point is this is supposed to be high fat and low carb. Pretty much the opposite of this. Thanks for sharing though!